From the daffodils in the spring, like HOT PINK and BOLD PINK (Yes, folks, they are PINK!) to armloads of coppery-orange JAMES M. dahlias in the fall, the creations of Dave Niswonger have truly made him a "hybridizer for all seasons." 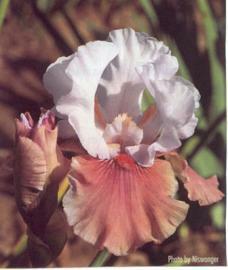 He registered six gladiolas and won an All American award for glads. 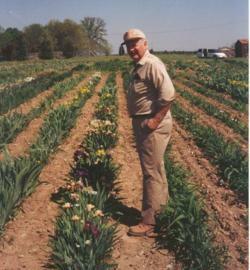 Currently he has an ongoing and successful daylily breeding program, creating advances in reds as well as outstanding pinks, lavenders and other beautiful colors. 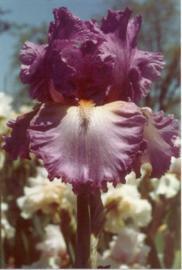 In the iris world, beginning with his first introduction SAPPHIRE FUZZ in 1967, he has introduced 268 varieties, covering all species. Two originations, BROWN LASSO (which he introduced for the late Eugene Buckles) and EVERYTHING PLUS both won the coveted DYKES MEDAL! 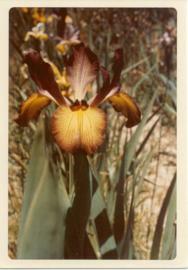 He joined the American Iris Society in 1952, and served as PRESIDENT from 1996-99. Currently in 2001, he is the Awards Chairman. Even winter doesn't slow him down. 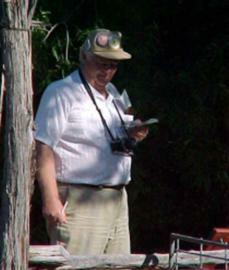 That is when he pursues his hobby of genealogy. His ancestors emigrated from Switzerland. A wagon train of emigrants crossed the frozen Mississippi on New Year's Day of 1800, bringing the Joseph Niswonger family to the bottom lands of Cape county, where they settled. On September 17, 2000, a gathering of 100 of the clan gathered at the Niswonger church to commemorate their 200th anniversary. Dave spoke to the gathering. Dave was born at Patton, Missouri, on his grandparents farm. 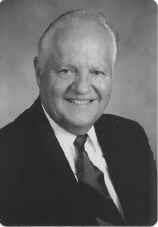 The senior Mr. Niswonger was a Methodist minister, and the family moved all over central and southeast Missouri. Dave's interest in gardening was stirred by helping his hard-working grandparents raise chickens, onion sets, sweet potatoes, etc. to pay for their farm. 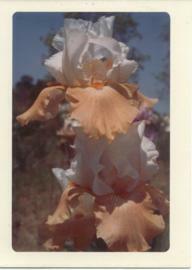 Beginning with raising his own tomatoes at age six, by twelve Dave had "branched out" to grafting. His plan was to graft sweet cherries on wild cherry trees, and he devoured books on the subject. Unfortunately, the books didn't say that you had to take wood in the wintertime and keep it refrigerated and moist, so all his work had been for naught. He persevered, doing a lot of work with nut trees. Stately English walnuts and pecans grace his property today, a testament to his work. 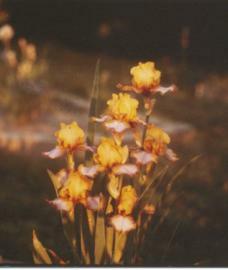 Perhaps this is where he developed the patience to wait the required 7 years just to see a daffodil bloom from seed! 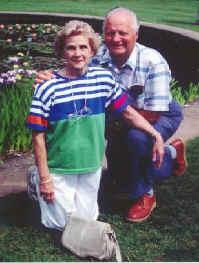 Dave and his wife Marie have two sons David III and John, and a daughter, Mary Dee. Interestingly enough, all the Niswonger children were born on February 25 in different years! They have five grandchildren, Lillian, Jiang Lee, Carolyn Marie, Kathryn, Joseph and Kali. 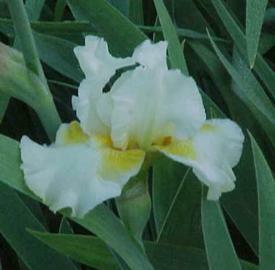 Every spring, enthusiasts wear down the grass paths between the raised beds of iris in his Cape Girardeau garden. 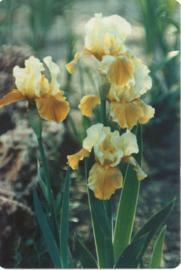 The newest of the world's hybridizers, as well as his new introductions and selected seedlings unfold to an appreciative audience. 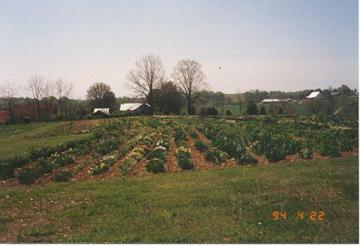 For a real treat one only has to go a few miles out of town to his farm at Gordonville where thousands of seedlings flutter in the spring breeze. Here his future superstars are "waiting in the wings." Dave good-naturedly endured teasing by his fellow hybridizers as "that guy who names so many of his originations after good things to eat!" His creations LOOK as good as they SOUND! Dave readily admits finding good variety names is one of the hardest tasks he faces, and he's always open to suggestions. 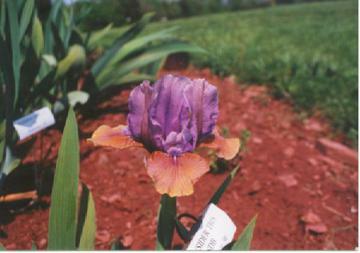 His breeding has brought a number of "haloed" varieties in colors like rosewood, gold, pink, orange, peach and cream.